Talbot Humane often has families with young children who want to get involved and make a difference for the animals of our community. One way to benefit both child and pet is our PAWS to Read Club. This program allows children accompanied by an adult to come to Talbot Humane and read to a shelter pet- dogs and cats alike! The quiet reading of the child helps soothe the animals, while the non-judgement of the animal allows the child to read without pressure. “Programs such as this have popped up in shelters across the country,” states Patty Quimby, Talbot Humane Executive Director. “We have been looking for ways to engage younger children who cannot volunteer in direct animal care. 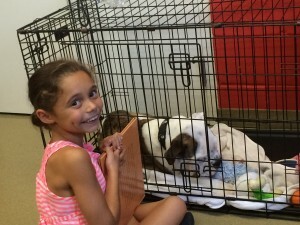 This is an amazing way to encourage reading and kindness to animals all at once.” If you and your child are interested in joining the PAWS Reading Club, contact Patty Quimby at patty@talbothumane.org or (410)822-0107 today!